Benjamin draws upon his 15 years of creative development, artistic leadership, and social entrepreneurship to help senior executives, management, and sales teams increase their creative capital in business leadership and team building, individual productivity, and presentation acumen. His out-of-the box approach and result-oriented process has proven effective in numerous industries including healthcare, automotive, fitness, financial services, entertainment, and non-profit, as well as multi-faceted organizations. Detailed and effective diagnosis, transference of knowledge to equip individuals with the mindset and tools to solve problems, and ongoing evaluation of progress is part of every engagement. Through in depth conversation, reflection, and unique solutions, the client is challenged to apply their natural creative abilities to overcome limitations and maximize performance. Coached an extremely qualified CEO of a 10 million dollar non-profit whose limited ability to present, network, and “work a room” was slowing the company’s growth. We worked together to recognize the blocks in her confidence and develop a personal process that allowed her to overcome the limitations. Coached the senior HR executive of a 200 million dollar company whose team was suffering from low morale and whose executive presence was lacking. Worked closely with her to reignite a love for her work and implement creative team building solutions that inspired a spike in workplace morale and productivity. Benjamin has experience developing the work of Academy Award, Grammy, Emmy, award winning professionals. As a social entrepreneur, he is responsible for a world-wide movement of Free Listening and a ground breaking approach to service through art. He has held faculty positions at the University of San Diego and the Theatre of Arts in Hollywood, CA. He has also worked as Head of Production for a multi-million dollar production company and was responsible for the creative development and execution of films with 5 to 20 million-dollar budgets. Benjamin Mathes is a coach, artist, author, listener, and speaker who helps people maximize their creativity. He has delivered keynote addresses and led workshops for schools and organizations across the country, including Citrix, Vistage, Girl Scouts of America, PrimePower Services, WeWork, AdVentures, DePauw University, Auburn University, University of California–Irvine, and many more. Developed in one of the most influential underground acting studios in Los Angeles, Benjamin Mathes' approach to presentations, networking, and executive presence has been called “dynamic,” “bleeding edge,” and “a little scary.” In this presentation, he will demystify the art of acting and give you solid foundation to develop, communicate, and maintain your voice, your presence, and your story. 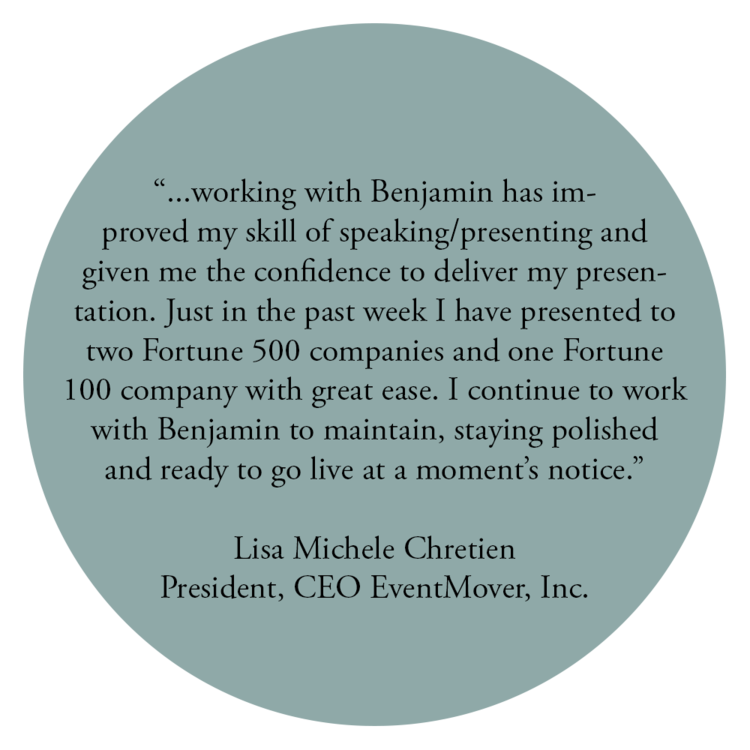 From networking, presenting, and inspiring belief in their employees, participants will walk away with a solid process for lessening nerves and heightening effectiveness in their presentations and pitches. Whereas other presentations offer robotic approaches to presenting, Benjamin’s work focuses on identifying individual issues blocking presentation effectiveness, and gives each participant tools that can be applied immediately to tap unrealized potential. Drawing from over five years of Free Listening on the streets, Urban Confessional founder Benjamin Mathes will give you the tools you need to effectively listen in business and life. Straight from the streets, his out-of-the-box approach will challenge you to embrace a new understanding of active listening that will help you more accurately diagnose your customer’s problems and more efficiently meet their needs. At the end of his presentation, you will know the four things that stop you from listening, how to remain hospitable in the face of conflict, and the true meaning of intentional listening. Designed as a holistic approach to career administration for actors, this course will give each actor the tools necessary to start, maintain, and continue a career in the entertainment industry. Rooted in artistic principles developed in one of Los Angeles’ most influential acting studios, this workshop will teach you have to have the career you want without losing the life you have. Participants will leave with a clear understanding of an actor’s foundation, relating to the industry, and who to build a path towards a lasting career as an actor. Nothing translates like experience. 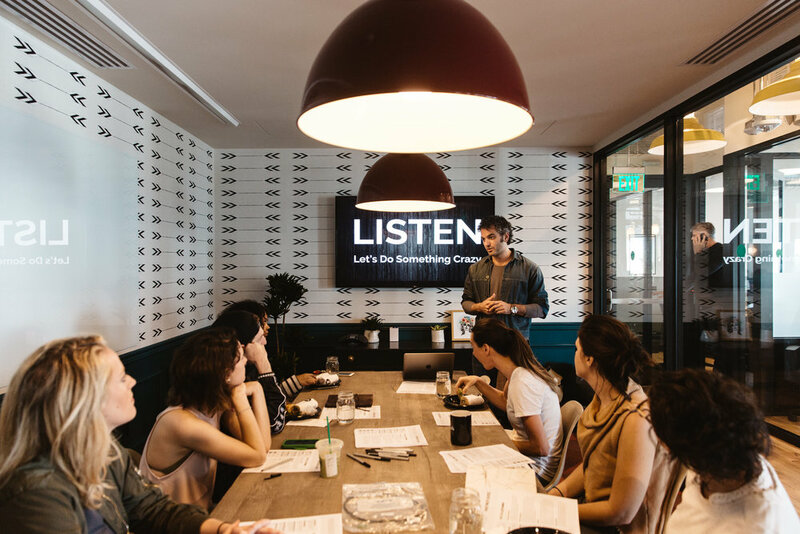 In this active workshop, Urban Confessional founder Benjamin Mathes will lead your group through the entire Free Listening experience. The workshop begins with a detailed training on listening; Free Listening signs are made, and participants are prepped for the unique experience of listening to strangers on the streets. After the training, participants take to the streets to Free Listen. For up to two hours, participants will offer themselves to their community as Free Listeners. After the Free Listening experience, Benjamin will guide a personal and extensive debrief. During the debrief, participants are challenged to translate the experience into their lives, leaving them with a deeper understanding of their listening abilities, the blocks that prevent them from listening, and how to apply these lessons to their relationships at home, work, or school. Contact bcmathes@gmail.com for rates and details. “Every organization could use Benjamin's work. Thought provoking and bold, Thought Lozenges will help you believe there is something bigger. That the joy and wonder of art can transcend the laws of technique and the rigors of the artistic profession. Thought Lozenges dares readers to be savage, optimistic, and unrefined. It dares them to be artists. It's time to pull your feet from the tar, to jump from the plateau, to break down the wall, to slay the giant, to step into danger. It's time to go from where you are, to where you'd like to be. Buy together and save $5, plus only pay the shipping rate for one book! Bundle includes one copy of Thought Lozenges and one Crash Journal.